STA. 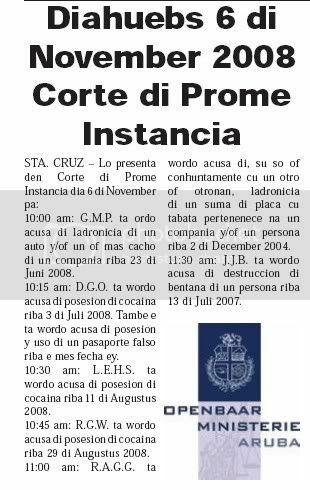 CRUZ – Dos siman pasa a trata e caso di e pedofiel A., kende a wordo haya culpabel di a comete actonan inmoral cu su yiu di crianza na 2006 y tambe di a tene relacion cu otro menor na Juni 2008. Fiscal a exigi 4 aña di prison pa e sospechoso, pero a pesar di esey huez no a sigui e exigencia aki. Ayera mainta huez a declara e ta haya A. culpabel di tur dos acusacion y a sigui e observacion di tanto psicologo como psiquiatra, kendenan no ta haya cu A. ta sufri di problema mental y cu A. ta responsabel pa su actonan. A tene na cuenta e hecho cu na 2006, A. a comete inmoralidad cu su yiu di crianza y dos aña despues a haci un delito hopi mas serio esta penetra un menor. 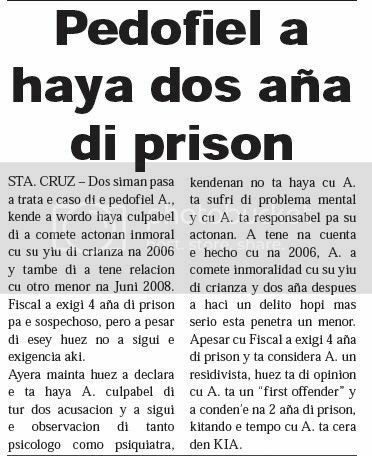 Apesar cu Fiscal a exigi 4 aña di prison y ta considera A. un residivista, huez ta di opinion cu A. ta un “first offender” y a conden’e na 2 aña di prison, kitando e tempo cu A. ta cera den KIA. STA. CRUZ—E homber A.L.U.L. naci na Peru di 32 aña, ta bai warda di Oranjestad hunto cu e muher M.A.D.D. 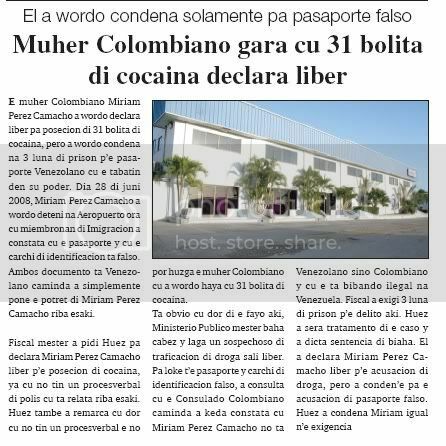 naci na Venezuela di 31 aña, pa haci denuncia contra e muhe V.G.O.J naci na Peru di 28 aña, kende ta ex amiga di e homber L. Nan ta bisa polis cu nan a bai na RCA, y eynan e muhe J, a bin hunto cu cuatro amiga mas y nan a maltrata D, na momento cu L. , a bay un rato den baño. Nan ta bisa polis cu esaki a pasa dia 28 di october. 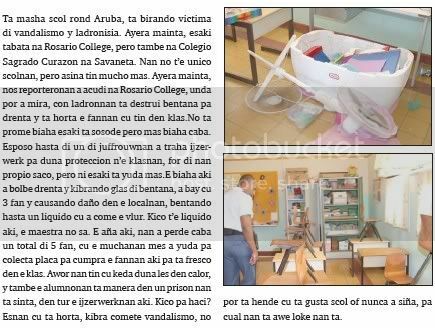 Nan a bisa tambe cu e dia ey, nan a bay na warda di Polis na Noord pa denuncia e caso, pero nada no a wordo haci. Recherche tin e investigacion. STA. CRUZ—Asistencia di polis a wordo pidi cu urgencia diahuebs 3.20 di merdia, den Boliviastraat, na Fruteria Virgilio, na unda e conocido Amaya, ta cana rond cu un hero y por causa daño na hende. 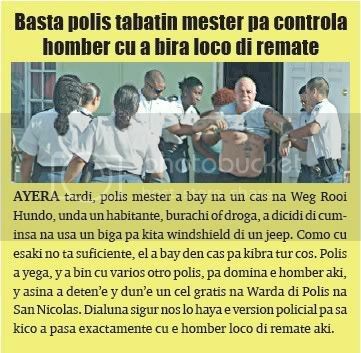 Polis a bay y ta topa cu Amaya cu un pida hero basta grandi den su man. Polis a dune ordo pa benta e hero abou, pero Amaya a ataca e polis cu e hero y hasta a alcanse. Mesora polis mester a saca su klop pa defende su mes. Cu hopi problema nan a logra detene y hibe warda, na unda el a keda sera te ora cu el a calma. Despues a lague bai bek riba caya. 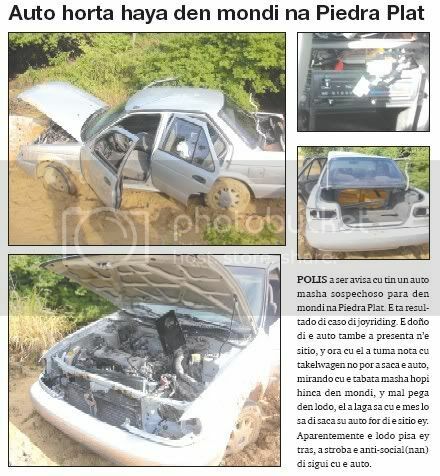 8:30 am: F. V. y G. ta wordo acusa di como ambtenaar of persona den servicio publico, nan so of conhuntamente cu otronan, a repitidamente y intencionalmente malversa sumanan di placa den e periodo di Februari 1997 te November 2007 y/of a permiti pa otronan haci esey y/of a sirbi como complice. Tambe nan ta wordo acusa di a repitidamente traha bestelbonnan y/of inkoopordernan y/of facturanan y/of ofertanan falso o a falsifica esakinan den e periodo di Februari 1997 te November 2007. V. y G. ta wordo acusa di nan so of conhuntamente cu otronan, a repitidamente y intencionalmente haci uso di e bestelbonnan, inkoopordernan, facturanan y/of ofertanan falsifica aki den e periodo ya menciona. F., V. y G. ta wordo acusa di tabata tin un suma di mas of menos 5.821.455,86 Dollar na man y/of a entrega e placa aki y/of a haye, di cual nan tabata sa cu el’a bin di malversacion y/of falsificación den e periodonan di Februari 1997 te 11 di Mei 2006 y di 12 di Mei 2006 te November 2007. Pro forma. 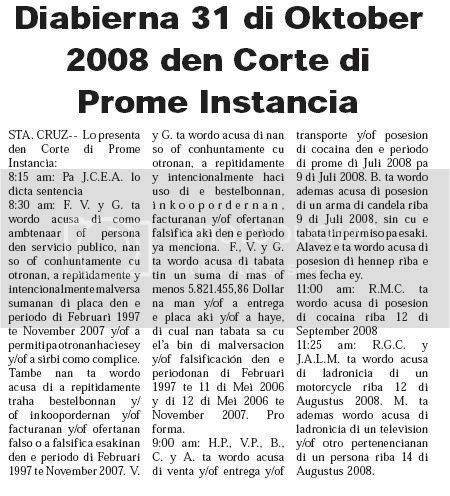 9:00 am: H.P., V.P., B., C. y A. ta wordo acusa di venta y/of entrega y/of transporte y/of posesion di cocaina den e periodo di prome di Juli 2008 pa 9 di Juli 2008. 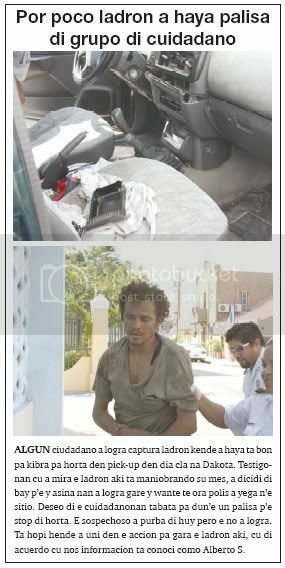 B. ta wordo ademas acusa di posesion di un arma di candela riba 9 di Juli 2008, sin cu e tabata tin permiso pa esaki. Alavez e ta wordo acusa di posesion di hennep riba e mes fecha ey. 11:25 am: R.G.C. y J.A.L.M. ta wordo acusa di ladronicia di un motorcycle riba 12 di Augustus 2008. 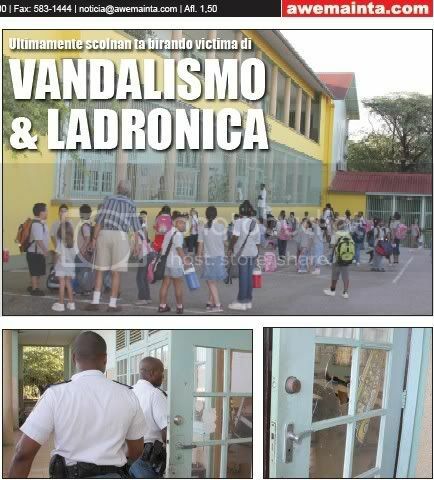 M. ta ademas wordo acusa di ladronicia di un television y/of otro pertenencianan di un persona riba 14 di Augustus 2008. 10:00 am: G.M.P. 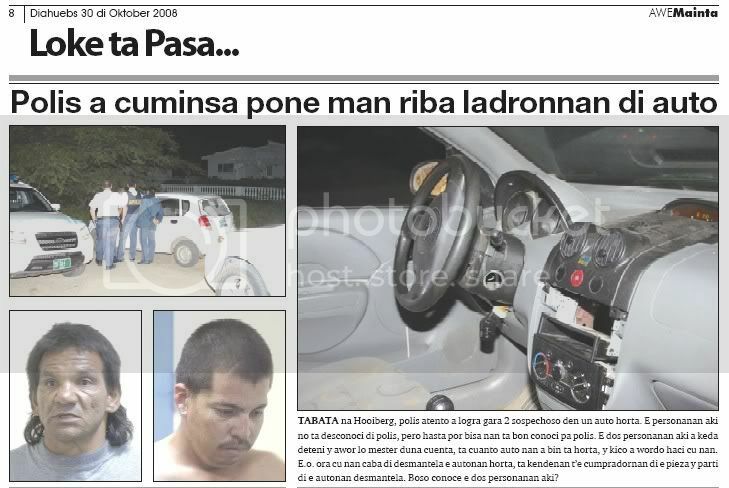 ta ordo acusa di ladronicia di un auto y/of un of mas cacho di un compania riba 23 di Juni 2008. 10:15 am: D.G.O. ta wordo acusa di posesion di cocaina riba 3 di Juli 2008. Tambe e ta wordo acusa di posesion y uso di un pasaporte falso riba e mes fecha ey. 10:30 am: L.E.H.S. 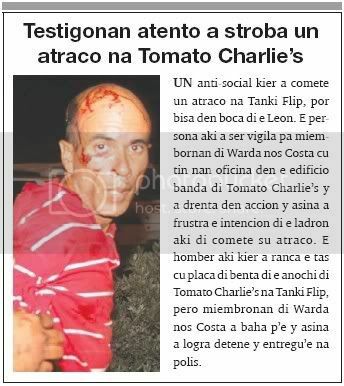 ta wordo acusa di posesion di cocaina riba 11 di Augustus 2008. 10:45 am: R.G.W. 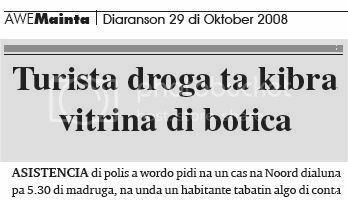 ta wordo acusa di posesion di cocaina riba 29 di Augustus 2008. 11:00 am: R.A.G.G. ta wordo acusa di, su so of conhuntamente cu un otro of otronan, ladronicia di un suma di placa cu tabata pertenenece na un compania y/of un persona riba 2 di December 2004. 11:30 am: J.J.B. 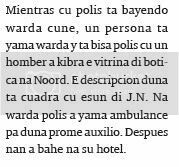 ta wordo acusa di destruccion di bentana di un persona riba 13 di Juli 2007.
mother bao of influencia is place child bay for of cas one mother owing to arrive cas 4.30 of madruga in fransebloemstraat y owing to calling ask asistencia of police for his son of 19 year, because; cu the is tell cu the child owing to become grocero contra dje. police owing to bay n’e cas y is talk cu the son of 19 year, that was trankil. past owing to tell police cu his mother owing to end of arrive cas, bao of influencia y owing to busca problem cune. hour cu past owing to tell the mother cu the is bay for of cas, the mother owing to angry y owing to calling police, saying cu the is one child rebel. police owing to talk cu the mother v.a.c. of 42 year, that is tell police cu his son of 19 year, owing to become grocero contra dje. the child tog owing to dicidi of bay sleep at home of neighbour, for give the mother chens p’e fria his cabes. in day cla thief is break car asistencia of police owing to wordo ask tuesday afternoon for 1.30 in anasatraat, near of one business, where one thief owing to break in one car. 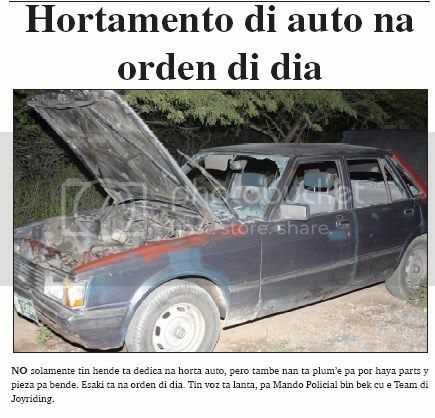 the owner is tell police cu the was trahando in the lugar y owing to see one man sit in his car part behind. also past owing to see cu he owing to break the window of the car. hour cu police owing to arrive, the owner had he owing to.a.s. wanta. police did take y owing to hibe keep. according the owner owing to tell police cu at one distancia had one another thief stop supuestamente cocolizo, but past owing to core bay. this t’e version of police, of thing we of awemainta owing to publica yesterday end. watch of 75 thousand dollar steal in joyeria owing to stay localisa the team of recherche cu owing to work on the caso of ladronisia in one joyeria in centro of oranjestad, where one thief venezolano owing to bay cu one watch of 75 thousand dollar, owing to stay soluciona. 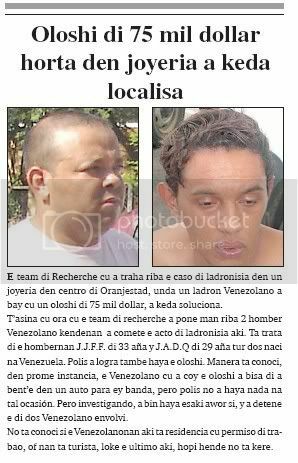 t’asina cu hour cu the team of recherche owing to place hand on 2 man venezolano kendenan owing to comete the acto of ladronisia here. is deal of the hombernan j.j.f.f. of 33 year y j.a.d.q of 29 year all two naci at venezuela. police owing to succeed also achieve the watch. as is conoci, in first instancia, the venezolano cu owing to coy the watch owing to tell of owing to bent’e in one car stop ey near, but police not owing to achieve nothing at such ocasión. but investigando, owing to come achieve this now if, y owing to detene the of two venezolano envolvi. do not conoci if the venezolanonan here is residencia cu permission of trabao, or they're tourist, thing the ultimo here, much person do not believe. past owing to stop of drugs y owing to change his life young cu was adicto now is struggle for leave for of situation dificil cu the is pasando inside at home remigio c. his declaracion yesterday in corte owing to convence fiscal y huez cu past owing to stop of drugs y cu the is bayendo on the good caminda. 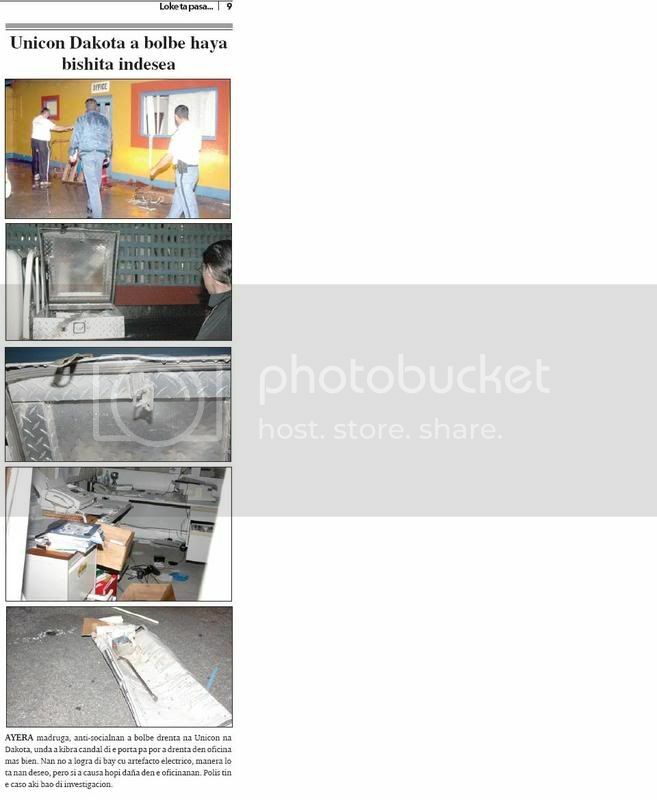 remigio of 19 year is wordo acusa of owing to steal for of one cas at stone plat day 23 of april 2006. in the cas past owing to bay cu one box of stainless steel cu was contene two book of banco, 150 guilder y some holoshi. remigio owing to count ; huez cu after cu past owing to leave pound, past owing to dicidi of change his life. t’asina cu past owing to bay centro dakota y also owing to achieve aid of reclasering. in sitting-room of corte was present his aunt, that owing to count ; huez con past owing to help remigio same cu is his child. remigio owing to tell cu past owing to stay straña cu his mother not owing to present in corte. past owing to splica huez the situation cu the is bibando at home. formerly the was live serca his aunt y now is bibando n’e cas cu his father cu owing to fayece owing to let for they. according remigio his mother is problematico. past owing to tell cu owing to mother do not work, but is blo drink. the mother owing to stay without pay coriente cu water for some month y esey owing to conduci cu owing to clip coriente y water n’e cas. for colmo the mother owing to bay let they only in the cas. now is seems cu the mother wanted go back. remigio owing to tell cu the is pasando in instant dificil already cu his brother man do not haci nothing y do not help mantene the cas. despite of all the dificultadnan remigio not owing to cay bek in drugs. fiscal is much contento for see con remigio, despite of all the dificultadnan owing to know of bay fast. the is achieve cu not have to impone one castigo already cu this will stroba remigio of follow bay fast. 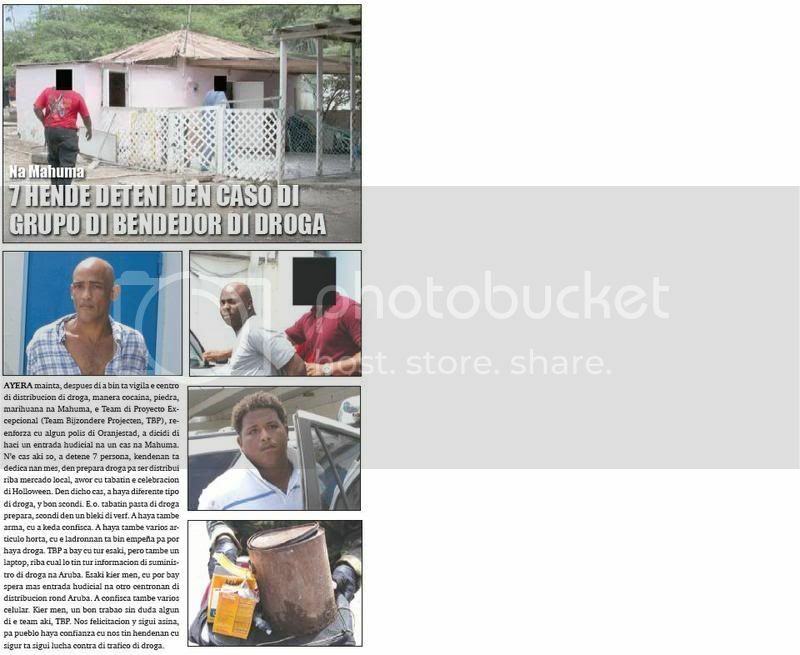 past owing to exigi 10 day of jail, cu is the dianan cu remigio was close p’e caso here. advocate mr. lotter homan also is achieve cu remigio is bayendo on the good caminda y owing to bay of acuerdo cu the exigencia of fiscal. huez owing to close tratamento of the caso y owing to impone the same castigo cu fiscal owing to exigi.